To launch the new restaurant section of our blog I’ve got a wonderful experience to share about a fantastic restaurant on the Costa Brava. Alexis and I went to Barcelona to visit my brother who lives there and we decided to go and spend two nights at Lloret de Mar in Costa Brava. It’s only an hour bus ride away from Barcelona so very easy to get to. We went end of March so got an incredible deal on a 4 star hotel on the beach front at only 35 euros a night. Being by the beach I wanted to eat some seafood and found a restaurant only five minute walk away called Galicia Mar. We weren’t sure what it was going to be like but as we strolled up to the restaurant through the window I spotted a huge platter of seafood that two women were sharing. Now that was what I wanted to eat! We went in and were seated by a lovely waiter and ordered the platter. Whilst we waited the owner and head chef came over to our table and asked how we were, he joked about a photo of himself on the wall with an enormous lobster – I can’t remember how many kilos he said it was but it was huge. 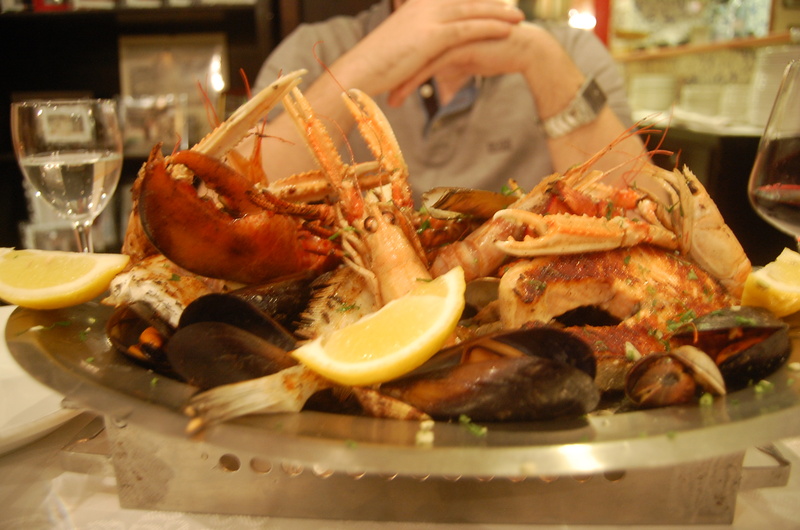 The platter arrived and at 41 euros it wasn’t disappointing – we had half a lobster, clams, mussles, prawns, langoustines and about 4 different types of fish. I was stuffed! Once finished the chef came and asked us how we had found the platter – and after a bit more banter he whispered something to the waiter. 10 seconds later he arrived with a bottle of cava – for our hotel room he said. I had been trying to speak to him in my broken Spanish and so my immediate thought was – ‘oups did I order this without realising…’ We asked for the bill and double checked and to our surprise it was indeed a gift to us. If you are ever in Lloret de Mar you definitely need to pay this restaurant a visit.